One island, three cities, seven miles, and lots of snow white, sandy beaches with spectacular shells against a setting of turquoise waters. It’s the beaches that draw people here, but the whole island experience is much, much more. As the sun started to create its evening canvas of oranges, pinks, and yellows, there were streams of people heading towards the water to snap a memory to share with family and friends. Ah, vacation had started. A week of no alarm clock, no meetings, and no rush-hour traffic. Get off the plane, grab the luggage, hop on the shuttle, and head to the island. As soon as I stepped foot onto the island, I knew I had found paradise. Anna Maria Island, Florida is like no other island I’ve visited. No high-rise hotels, no noisy spring break bars, no downtown streets packed with cheesy souvenir shops. Just a laid-back, relaxed life with all the other tropical beach lovers! Here are the options: bikes, scooters, golf carts, Segways, and a free trolley. Since the island is small and the main streets include bike lanes or sidewalks, safety is not much of an issue. Additionally, the maximum speed limit is 35 mph, but most streets are designated at 25 mph. 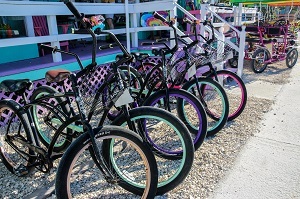 There are a number of vendors who rent bicycles, starting with Beach Bums located on the north end of Anna Maria Island at 427 Pine Avenue. They have cruiser bikes, tricycles, surreys, golf carts, and even electric bikes. They also carry bike accessories such as trailers or bike seats to accommodate youngsters. The best convenience of all is they delivered right to my front door. Beach Bums golf carts have seating for either four, six, or eight passengers. So no matter what the occasion, there is always room for the gang. Since the carts are street legal, exploring all seven miles of the island is a piece of cake. 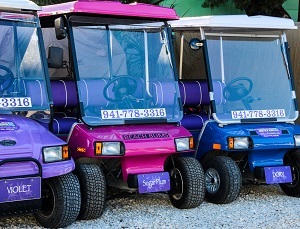 A driver’s license and insurance card are required to rent a golf cart on the island. 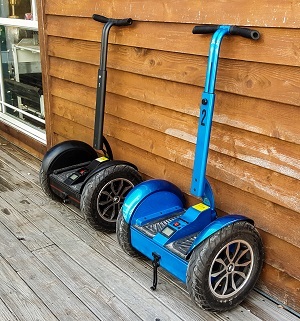 Another option is a scooter from Island Scooter Rentals at 9908 Gulf Drive. The best part of using a scooter is that they get 100 miles per gallon! There are new scooters of all sizes that can be rented by the hour, day, or week. They also rent water equipment including kayaks, body boards, stand up paddle boards, and beach carts… all that’s needed for a sun-filled day at the beach. For a really different wheel adventure, Segways are available for rent. Segs By The Sea is located in Bradenton Beach at 102 Bridge Street. They provide either a guided tour or a self-guided tour. Training and helmets are provided. There are different tours of the local area waiting to be explored. They can even put together a special event like a scavenger hunt on a Segway. The Anna Maria Island trolley is free and runs from the north end of the island at the City Pier to the south end at Coquina Beach. It carries travelers seven days a week from 6:00 a.m. to 10:30 p.m. and has stops that connect to regular buses. After an evening of dining and walking around, what a relief to hop on the trolley the rest of the way home. So there’s a variety of choices when it comes to exploring Anna Maria Island. By vacation’s end, I had been able to experience the full beauty of this quaint island by choosing alternatives to a car. I could boldly go where no car had gone before and have a whole lot more fun doing it! To get to Anna Maria Island, fly into either Tampa International Airport (TPA) or Sarasota-Bradenton International Airport (SRQ). Airport transportation is available through AMI Transportation or Island Sedan. The island is approximately 45 minutes south of Tampa.